Now it looks like next Friday could also mark a significant date for the future of the MSS industry, as that is the deadline for TerreStar Networks to submit its Disclosure Statement and Plan of Reorganization for emergence from bankruptcy. That Plan could reveal details of how TerreStar Networks intends to move forward with both its MSS services and attempts to monetize its ATC spectrum. We also may find out more about what is likely to happen with the TerreStar-2 satellite, which could end up being used to support a European S-band project. This comes at a time when we are waiting to see what happens to DBSD, after its attempted emergence from bankruptcy was stayed by the Second Circuit in early October. Even more importantly, there appears to be an ongoing battle between Harbinger/LightSquared and Clearwire to secure a partnership with T-Mobile, as the current Clearwire auction moves towards a conclusion (most likely before Thanksgiving). Securing a partnership with T-Mobile could be a make-or-break situation for Harbinger and LightSquared, as T-Mobile is the only major US wireless carrier still to decide how it will move forward with 4G. There has even been speculation from Credit Suisse about a grand bargain that would bring together all three of these ATC spectrum holders. However, with Harbinger now buying the unsecured Exchangeable Notes at TerreStar Networks at 43.5 cents on the dollar, which were only supposed to receive up to 3% of the restructured equity (i.e. less than 20 cents on the dollar), a challenge to the TerreStar Restructuring Agreement might appear to be a more likely outcome. As a result, the next week is likely to be filled with plotting, but let’s just hope that by next Friday any gunpowder will be signaling celebration rather than destruction in the MSS industry. Today we’re releasing our new profile of LightSquared, which contains a detailed analysis of their LTE business plan and a discussion of spectrum valuation and regulatory issues, all of which will be very relevant to those seeking to understand the implications of these events. Our MSS operator profiles are sold individually and are priced at $995, including a free one hour discussion of our analysis. On Monday we’ll also be releasing a new report with details of MSS industry developments, including Inmarsat’s Ka-band system, regulatory and financial ATC-related developments and updates on market growth, which is available exclusively to subscribers to our MSS information service. Contact us if you need any more information about our research. Analyzing the spectrum “crisis”: can upgrade costs be ignored? We’ve already expressed some skepticism about both the methodology and the underlying growth assumptions used in the FCC’s Mobile Broadband Spectrum Forecast. It also appears that there is a limitation in how upgrade costs are treated in the FCC’s model. Specifically, the FCC model assumes that the “economic value” of additional spectrum is based on avoiding the construction of more cell sites by using additional spectrum at existing cell sites to accommodate the increased traffic load. 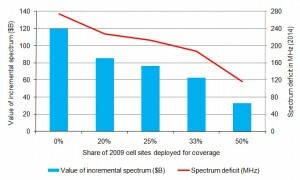 However, the model ignores the cost of upgrading existing base stations to make use of this additional spectrum. The underlying assumption which is used to justify ignoring this upgrade cost is that existing base stations will be upgraded anyway to 3.5G or 4G technologies. However, it is not always the case that these upgrades can accommodate more spectrum at no incremental cost. That might be a reasonable assumption if a PCS base station adds more PCS spectrum. However, if the new spectrum is at a considerably different frequency (e.g. adding 2.5GHz spectrum to a 850/PCS/AWS network), then it may not be possible to re-use a common set of antennas (potentially implying additional tower lease costs) and in some circumstances it may even be necessary to use a completely new cellsite plan, due to the different propagation characteristics (cell radius) of the new spectrum (although this may be mitigated if the spectrum is being used to add capacity in dense urban areas where the cell radius is very small regardless of the frequency). Thus though these incremental upgrade costs might be somewhat limited (perhaps a few billion dollars?) they can’t be completely ignored when operators decide whether to buy more spectrum or add cell sites in their existing spectrum, and they become more significant if usage growth and the need for spectrum are lower than expected. 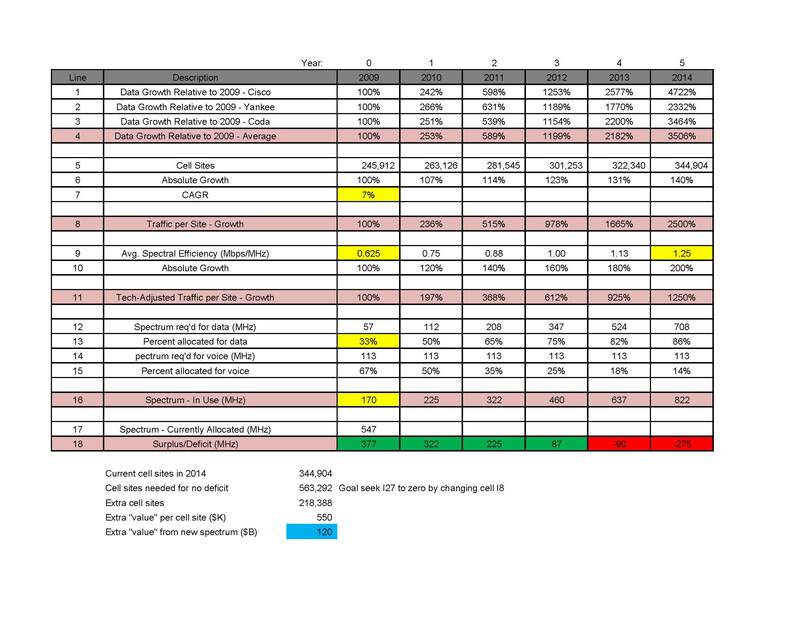 After looking at the consequences of what appears to be a mathematical error in the FCC’s Mobile Broadband Spectrum Forecast last week, I thought it would be useful to look at some of the underlying traffic growth forecasts themselves. The FCC forecast gives some detailed projections of traffic growth per device and device penetration in 2014 in a couple of its exhibits, based apparently on Cisco data, split between “basic and feature phones”, “mobile broadband handsets” and portable devices (“computing devices (netbooks and notebooks), tablets, handheld gaming consoles, e-readers, digital cameras and camcorders, digital photo frames, and in-car entertainment systems”) either as substitutes or complements to fixed broadband. The forecast assumes rapid growth of take-up and traffic for data intensive devices, but what is remarkable is that more than two-thirds of all the traffic in the Cisco model comes from portable devices. 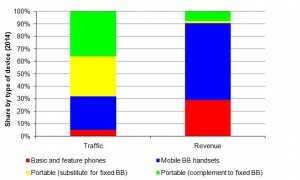 However, under any reasonable assumptions about ARPUs from each type of device (unless you assume “voice will be free” as Cisco used to assert) – say $40 per month for “basic and feature phones”, $69 for mobile broadband, $35 for fixed broadband and $25 for portable devices, then less than 10% of 2014 revenue comes from this 68% of traffic, as shown in the chart below. (Note that these ARPUs were chosen to match with annual revenue growth of 7.5% p.a., which is in line with the growth rate from 2005 to 2010 according to the CTIA). In this case, the solution to the spectrum “crisis” is pretty clear (especially for AT&T and Verizon) – sell people DSL/FiOS/U-verse/cable broadband with WiFi, and limit their use of complementary portable broadband devices, unless they are either high end (laptop) users, or don’t use much bandwidth (Kindles). In any case, certainly don’t allow them unlimited usage. If you’re a second tier player then you have to decide if you can afford to meet the needs of these portable device customers, or if targeting the other 90% of revenues is enough for now. If you’re a new entrant trying to go after these portable device customers, then you’d better hope your spectrum really is very cheap. Perhaps you can hope that by serving people’s portable devices you can capture all of their mobile spending (i.e. provide them with a phone as well)? Maybe that could be the case some of the time (though somehow I doubt that buying a Kindle or a camera or a photoframe is going to make you switch cellphone provider), but isn’t it just as likely that the big players will offer “family plan” type bundled rates for various other devices and just keep a tight lid on their usage? How much more do you really want to spend each month on all these devices in addition to your current cellphone bill (indeed is $25 per month even remotely achievable as an average ARPU for these sorts of devices)? After all, a lot of people (myself included) have apparently decided not to bother with 3G iPad connectivity at $25 per month. Perhaps it could be argued that in fact voice (VOIP) might well be free eventually, so operators have to get used to that and go after these portable device customers instead. 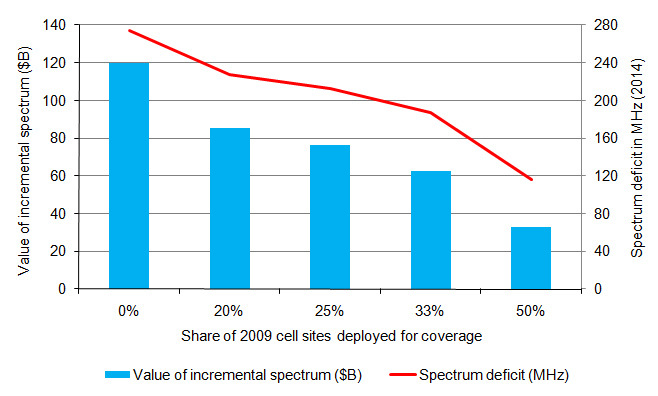 However, that outcome is even worse for spectrum valuations, because if 70% of current wireless revenues are destined to disappear then investment dollars for 4G buildouts and spectrum will be pretty hard to come by. UPDATE: We understand that there is an inconsistency in the FCC report between the data for usage growth per device from 2009-13 (from the Cisco 2009 report) and the penetration in 2014 (from the Cisco 2010 report) due to a major change in the definition of “portable complementary” devices. As a result the 2009 Cisco report predicts there will be about 11M portable complementary devices in 2013 but the 2010 report predicts there will be 51.8M of these devices in 2014. Because the underlying data in the Cisco report is not published (and no definitions appear in the paper), it is hard to see whether the 2009-13 data usage numbers are still valid for 2014 or not. However, our estimates are quite close to the total data usage predicted for North America in 2014 and Cisco certainly assumes that the vast majority of data usage in 2014 comes from “portables, netbooks and tablets”. Spectrum crisis or spectrum bubble? I vividly remember attending the Cisco analyst conference in the fall of 1999, soon after I moved to the US, and being confronted by a rosy picture of ever increasing demand for telecoms equipment because of the dramatic growth in Internet traffic. I was moved to ask the question of whether in fact we were in a bubble, and if Cisco’s revenue trajectory would therefore end up resembling its logo. Perhaps unsurprisingly, I was never invited back to that particular event. This evening I took the time to read Andrew Odlyzko’s seminal paper on Internet traffic growth in the 1990s. This paper explores the myth that Internet traffic was doubling every 100 days, which was a key contributor to the telecoms bubble of the late 1990s, and the subsequent loss of hundreds of billions of dollars of investors’ money. One of the highlights mentioned in Odlyzko’s paper was former FCC Chairman Reed Hundt writing in his book You Say You Want a Revolution that “[i]n 1999, data traffic was doubling every 90 days ….”. In reality, Internet traffic was growing rapidly, nearly doubling every year, but the growth rate from a short period of initial growth in 1995-96 had been erroneously equated to a long term growth rate. It was of course in everyone’s interests to promote this myth – it pumped up valuations, allowed startups to raise billions of dollars, and enabled politicians and others (such as Cisco) to claim credit for developing “the new economy”. Thus it is particularly striking that we now see the current FCC Chairman using a flawed study to promote the “transformative moment we must seize” because “we are likely to see a 35X increase in mobile broadband traffic over the next 5 years” (based ironically to a significant extent on Cisco forecasts). We also see startups such as LightSquared and Clearwire raising (or at least trying to raise) billions of dollars on the back of their spectrum assets to build out new networks and realize the “extraordinary opportunity of communications technology” that the FCC Chairman envisages. Of course it is true that mobile broadband demand is growing rapidly, just as Internet demand was growing rapidly in the late 1990s. However, perhaps we should pause and ask whether we are in danger of repeating some of the mistakes of a decade ago? When cellular operators, spectrum owners, equipment suppliers and regulators all have a vested interest in talking up the spectrum crisis, there has to be a danger of disappointment. I’ve already commented that spectrum might not be such a good investment and that the Clearwire auction looks to be going badly. There are even rumors that Clearwire is preparing for a round of significant layoffs. As a result I have to wonder whether we will look back at this moment in six months or a year, and conclude that yesterday’s FCC spectrum summit marked the point at which the spectrum bubble began to unwind. Analyzing the spectrum “crisis”: can the FCC add up? Yesterday the FCC announced with much fanfare the release of a new technical paper giving its “Mobile Broadband Spectrum Forecast”, which was trumpeted by the FCC Chairman as putting “the importance of this debate in perspective by assessing the economic value of this spectrum, which it estimates to be as high as $120 billion”. The FCC paper is a fairly unsophisticated analysis, and its results contrast significantly with an Ofcom study released in April 2009 which found that under most scenarios for data growth the UK was unlikely to experience a spectrum crisis until 2020 or beyond. Although the UK is of course a very different market to the US, it was a surprise that the results were so dramatically different, which prompted us to take a closer look at the FCC calculations. Unfortunately it appears that the FCC analysis contains a significant error in its calculations. Specifically, while the study assumes that all future cell sites are deployed to add capacity, it neglects to take into account that a significant fraction of current cell sites were deployed purely for coverage in rural and suburban areas, and are unlikely to ever need more spectrum beyond that available today. As a result, following the FCC’s methodology, these cell sites should not be included when calculating how much new capacity and spectrum is needed (as the FCC indicates elsewhere in the paper, upgrading to more spectrally efficient technologies would provide significant gains and presumably sufficient capacity when data usage does increase in rural areas). UPDATE: Assuming somewhere between 20% and 50% of current cell sites (as of 2009) have been deployed for coverage rather than capacity (which seems reasonable, as according to the FCC Competition Report, cellular voice services are provided to 60M people in rural census blocks covering 2.3M square miles, and 76% of these regions have two or more providers) then the FCC’s own analysis shows that the incremental spectrum demand by 2014 is reduced from 275MHz to between 117MHz and 227MHz and the cost of deploying extra cell sites to serve this demand (the FCC’s definition of “economic value”, assuming a cost of $550K per cell site) is reduced from $120B to between $33B and $85B. Only 60K-155K additional cell sites are needed to meet demand, compared to the 99K that the FCC’s model estimates will be deployed anyway in the next 5 years. Put another way, the annual growth in the number of base stations would increase from 7% p.a. to between 10% and 15% p.a., which is not significantly out of line with the 12% growth in base stations that occurred in 2009, according to the FCC’s own figures. One of the most important documents filed so far in the TerreStar bankruptcy case is the Restructuring Support Agreement, which TerreStar (and Echostar as the majority holder of the first lien debt) have committed to support as a basis for the plan for emergence from Chapter 11. This agreement will convert the Senior Secured PIK Notes ($944M of principal and accrued interest) into 97% of the new equity of TerreStar Networks (TSN), with the remaining 3% shared between the Exchangeable Notes ($179M of principal and accrued interest) and other unsecured claims. No distribution will be made to the original holders of interests in TSN (the 89% held by TerreStar Corporation and the 11% held by LightSquared). In addition there will be an offering of $125M of Preferred Stock to repay the DIP, with rights to subscribe to 97% of this Stock offered to the Secured Notes holders and the remaining 3% offered to the holders of Exchangeable Notes/unsecured claims. Echostar has agreed to backstop $100M of this $125M offering. The “net distributable value” under the Plan is set at $1.050 billion, and the Preferred Stock will be issued at a discount of 35%. Under the Plan the only outstanding debt after emergence from bankruptcy would be the Purchase Money Credit Facility (PMCF), which currently has $86M outstanding. The RSA also includes a declaration from Steven Zelin of Blackstone, which sets out details of the negotiation process leading up to the bankruptcy filing. Many of the developments are broadly in line with what we had surmised, notably that TerreStar had tried to float a much larger DIP of $250M, initially using the 1.4GHz spectrum and the ground spare satellite as security (after repaying the PMCF), and later by priming the first lien debt. However, neither option proved feasible, the first apparently because the 1.4GHz spectrum plus the ground spare satellite did not provide sufficient security, and the second because it was anticipated that a priming fight would be difficult to win. As a result, TerreStar was forced to accept Echostar’s proposal for a $75M DIP and plan of emergence set out in the RSA. The unanswered question is to what degree Harbinger is content with the outcome – it certainly appears to have been on the opposite side from Echostar in the early part of the negotiation process (apparently agreeing to participate in the first proposed DIP) but then it agreed with Echostar to provide a $10M advance under the PMCF, which explains how TerreStar managed to stay out of bankruptcy until now. However it seems a huge stretch to imagine that this means there is some agreement between Harbinger and Echostar to join forces and collaborate in LightSquared, as Credit Suisse have suggested. In particular, there are plenty of other reasons for both companies to have wanted to delay the bankruptcy filing: in Echostar’s case because they needed to negotiate over their own proposal, and in Harbinger’s case because they were trying to finalize additional funding for LightSquared. This afternoon, TerreStar Networks and various affiliates filed for bankruptcy, and entered into an agreement with EchoStar Corporation, its largest secured creditor, to provide the Company with a $75 million debtor-in-possession financing facility (as we surmised on Saturday). In addition, Echostar will support a restructuring premised on a debt for equity conversion by the Debtors’ secured noteholders, and backstop a $100 million rights offering that will provide the funding for TerreStar Networks’ exit from Chapter 11. 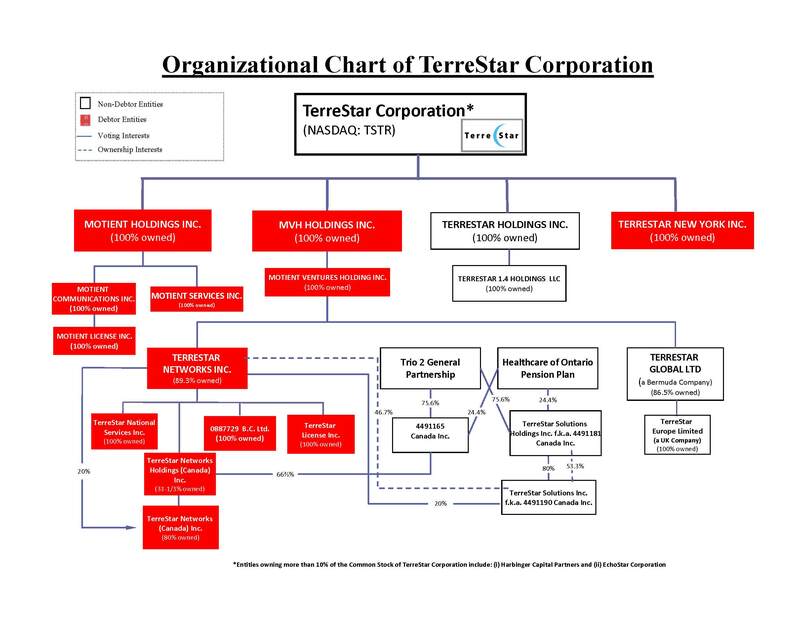 As shown in the diagram below from the TerreStar Networks Chapter 11 petition, the publicly quoted parent, TerreStar Corporation, did not file for bankruptcy, and presumably could continue to operate using the $2M per month that Harbinger is paying for its lease of the 1.4GHz spectrum. However, in the short term, this $2M per month will not be cash revenue, because the $30M advance received back in January covers payments for 15 months of the lease (i.e. until next May) and has already been spent. 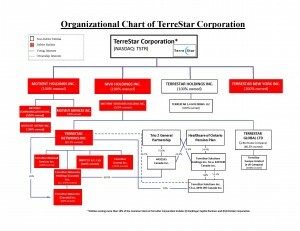 Thus it is unclear how TerreStar Corporation will find its near term operating funds. UPDATE: TerreStar Corporation has now filed an 8-K confirming the tolling agreement to suspend its litigation with Highland Capital and that Highland, Solus and Harbinger have agreed to loan the company $1.25M for a period of 75 days. It appears that this may provide a window of opportunity to either negotiate a sale of the 1.4GHz spectrum or decide if TerreStar Corporation should file for bankruptcy. TerreStar Corporation has also agreed that its shares will be delisted from NASDAQ. TerreStar Corporation will retain control of its 1.4GHz spectrum assets, but will see its shareholding in TerreStar Networks wiped out in the bankruptcy (note that both the TerreStar-1 and TerreStar-2 satellites and their 2GHz MSS-ATC spectrum allocation are included in the bankruptcy proceeding). As a result, the residual value of TerreStar Corporation will basically be equal to the value of the 1.4GHz spectrum assets. However, it is hardly plausible that this spectrum could be worth more than the $408M (+ accrued interest) outstanding in TerreStar Corporation’s preferred stock. Though a TerreStar bankruptcy has been rumored for several months, it has been a long time in coming. This appears to have been caused by several changes in plan, as it appears the original intention was to try and avoid losing control of TerreStar Networks and its spectrum, and raise money against the assets at TerreStar Corporation, a task which apparently proved fruitless. There is no mention of any role for Harbinger in the press release announcing the Chapter 11 filing, so it will be interesting to see what happens next with the 2GHz MSS spectrum. However, it certainly appears possible that there could be yet another source of spectrum on the market competing for buyers with Clearwire and LightSquared. TerreStar bankruptcy: who will provide the DIP? Reports have now emerged that a TerreStar bankruptcy filing may take place as soon as Sunday, October 17, with “one creditor” potentially providing about $75M in DIP financing. It would not be a surprise to see a bankruptcy filing this weekend, as the interest payment on TerreStar’s preferred stock, which was due on Friday, had always provided a deadline for resolution of the funding situation. Now the question turns to who will provide this DIP. The fact that it is described as coming from “one creditor” indicates that this is almost certainly Echostar, given that Harbinger could potentially face regulatory concerns if it was to acquire control of TerreStar in addition to LightSquared. As we noted in previous posts, it appears there may have been efforts earlier in the summer to syndicate a much larger DIP to other parties and cram-up the first lien debt. However, assuming these efforts have failed, Echostar presumably will be able to protect its first lien position by providing the DIP itself. It will be very interesting to see whether Harbinger will retain a position of influence in TerreStar or if it will end up largely sidelined in a TerreStar bankruptcy. In the latter case, it is quite plausible that in addition to Clearwire’s ongoing spectrum auction, Harbinger could find itself faced with competition for strategic partners from yet another source of spectrum – the opportunity to access the 2GHz ATC spectrum. Of course, some wireless operators might prefer the spectrum to be returned and re-auctioned without ATC constraints in an incentive auction, but even the initial rulemaking won’t be complete until sometime in 2011, and an auction could take another year or more to organize. Thus until the FCC completes its MSS rulemaking, the owners of the 2GHz ATC spectrum (at least other than Harbinger) would certainly have nothing to lose in seeking out a potential buyer. UPDATE: Harbinger has now stated that it is “not really involved anymore” with TerreStar, essentially confirming that it will not be providing the DIP financing. This comment also tends to suggest that Harbinger might no longer be in a position to prevent the owners of the 2GHz ATC spectrum seeking a spectrum buyer in competition with LightSquared. Will Clearwire provide a valuation benchmark for ATC spectrum? So news has finally broken that Clearwire is selling 40MHz of its spectrum, as we surmised back in May. However, the valuation range cited is relatively wide ($2.5B to $5B) representing $0.20 to $0.40 per MHzPOP, and Verizon (which was said to be one “potential buyer” of the spectrum along with AT&T, T-Mobile, Time Warner Cable and Sprint Nextel) has now denied it is bidding. It also hardly seems plausible that AT&T would be bidding for spectrum it was forced by the FCC to relinquish just a few years ago. As a result, the release of this information seems like it could well be an attempt to encourage bidding if the auction is not going too briskly, with “potential buyers” rather than actual bidders being listed to create an appearance of higher demand. If the end result is towards the lower end of the quoted range, then that would clearly be a negative sign for spectrum valuations – falling far short of the $0.50 per MHzPOP valuation suggested by Clearwire and some analysts back in May and coming close to the $0.17 per MHzPOP paid by Clearwire when it acquired spectrum from AT&T/BellSouth in February 2007. If that’s the case, then it would imply that the value of this spectrum has hardly changed in the last three years, despite the supposed “spectrum crisis” that has been widely discussed. Of course, the headline price for Clearwire’s spectrum is not the only factor that needs to be taken into account when considering this as a valuation benchmark for other spectrum bands. In particular, around 60% of Clearwire’s spectrum (in the EBS part of the band) was acquired under lease agreements, and though some of these are partly prepaid, others will require substantial future payments (totaling $5B over the next 30 years). Thus if Clearwire sells mostly owned spectrum for close to $0.20 per MHzPOP, then the implied spectrum valuation for other bands would be rather lower than if it sold a mix of leased and owned spectrum. Nevertheless, a low valuation benchmark might well make fundraising more challenging for ATC spectrum holders. LightSquared noted in its presentation at Satcon today that it acquired its spectrum for the “low cost” of $0.20 per MHzPOP, and while one can argue that the propagation characteristics of LightSquared’s lower frequency L-band spectrum make it more valuable than Clearwire’s 2.5GHz spectrum band, mobile operators who are seeking spectrum simply for fill-in 4G coverage in densely populated markets may not necessarily see it that way. LightSquared also has ATC-specific risks to consider, related to the aggressive buildout commitments it made to the FCC back in March and the need for rebanding in the L-band (with the associated substantial payments to Inmarsat). As a result it remains to be seen whether the investments that Harbinger has made to acquire LightSquared’s spectrum will still be seen as a low cost at the end of the Clearwire auction.